• Sign Cycles From O-P-E-N to 'Full Flash"
LED technology has never looked better. 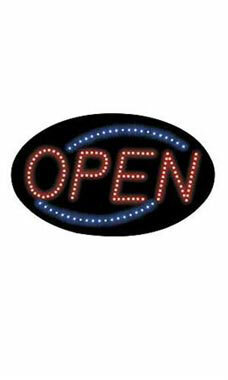 The Red and Blue Open Sign will guide customers to your business. A great sign if visibility is limited where your storefront is located. The sign is lightweight and easy to hang. Features include a switch on the back of the sign with on/off, ''Stationary'' and ''Flashing'' positions. Sign cycles from O-P-E-Not top blue lights to bottom blue-lights to the entire sign flashing. Sign plugs into any standard outlet. Signage guaranteed for 1 year.